Having received a brilliant reissue recently the classic The Return of the Living Dead is a zombie gore-fest full of fun and luckily for you we have a competition giving you the chance to win a Blu-ray copy packed with amazing extras. Written and directed by Dan O’Bannon, the pen behind Alien, Total Recall, Lifeforce and Dark Star, The Return of the Living Dead is a straight up 80’s zombie horror movie bursting out of the grave with flesh eating fun and it’s truly deserved of both its cult status and this DVD and Blu-Ray re-release – which will hopefully introduce it to a whole new horror audience. 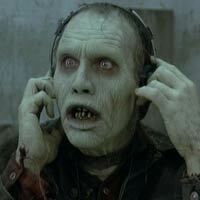 In The Return of the Living Dead which movie are the zombies kept in military cannisters supposedly the inspiration for?